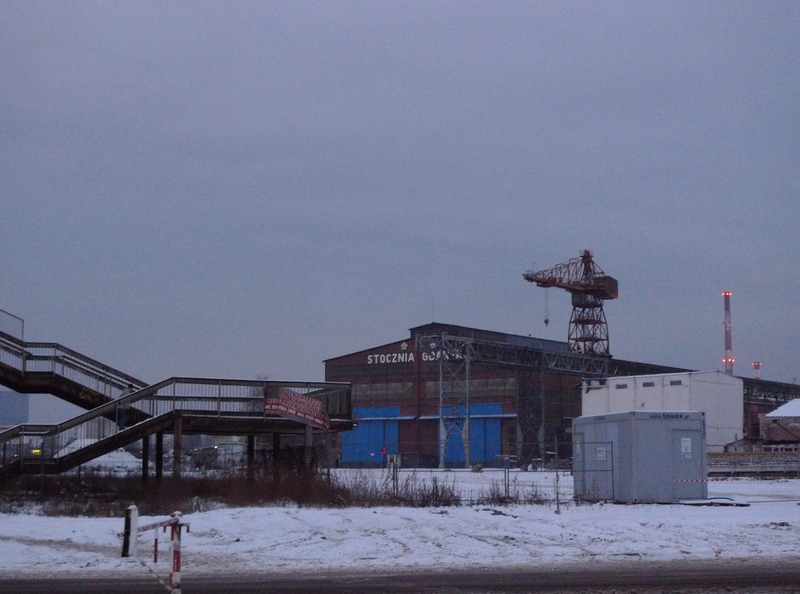 It is difficult, looking at rough and withering buildings of Stocznia Gdańska (Gdańsk Shipyard), to appreciate that in this very place history changed path. And yet the buildings were probably just as rough and uninviting in 1980 as they are now. It just did not matter. For a long time, Poland did not seem to be the luckiest player in the international game of politics. Following the Third Partition of Poland by Prussia, the Austrian Empire and the Russian Empire in 1795, the country has ceased to exist for the next 123 years. It was revived in 1918 – it is hard to discern whether the decisive role was that of Polish people fighting for freedom, or of European governments willing to bring back the old ally in the region. The following years were not peaceful by any means. First of all, there was the Polish-Soviet War in 1919-1921 – the first and definitely not last attempt to expand Soviet rule. Then, a mere 18 years later – a time barely enough to raise a young adult, and definitely not enough to rebuild a state – the joined forces of the Third Reich and Soviet Russia, united under the secret Ribbentrop-Molotov pact, attacked Poland from both sides, thus obliterating it again in mere few weeks. With the attack, World War II had begun. We all know about the the horrors of this war. What’s important for the story I want to tell today is the change of alliance in 1941, when Nazi Germany attacked Soviet Russia. Though it would take four more years filled with millions of deaths to stop the Nazi German reign, from this moment on Soviet Russia became a member of the Allies of World War II. And it was a strong ally – such that during the Yalta Conference, a meeting in Crimea in February 1945 between President Franklin D. Roosevelt, Prime Minister Winston Churchill and Premier Joseph Stalin, concentrated on Europe’s post-war reorganization, Stalin was able to dictate quite a few points to his liking. It is not that surprising when one realizes that at the time of the Conference the Red Army held much of Eastern Europe with a military force three times greater than Allied forces in the West. Poland was in every way the center of the Soviet agenda. Stalin stated that the security of Poland was close to his heart both because of a historical debt of Russia towards Poland, with Soviet Russia striving to atone for the sins of Russian Tzars, as well as because of the geopolitical situation in the region, claiming that a strong, free, independent Poland would be a yet another guarantee of safety for Soviet Russia. The Soviets have always had a great way with words. All the round, good-natured and benevolent sentences they’ve ever said carried nothing but a threat. Stalin got what he wanted at the Yalta Conference, which pretty much entrusted Poland to his care. After the World War II, the liberated countries were supposed to establish democracies and hold free elections. It was already a point of concern during the Potsdam Conference, held in the summer of 1945, that the Red Army forces were still present in Poland. In just a few months Stalin had also effectively set up a temporary Communist government there. Then the Polish people’s referendum was held in 1946, and next the Polish legislative election was held in 1947. Both were forged, the latter with the help of NKVD. From then on, Poland was a communist country belonging to the Eastern Block. One of the biggest flaws of Communism was that it could not sustain itself. None of the communist countries could truthfully boast about its prosperity – on the contrary: people were beyond poor despite their hard everyday work. Aren’t the cranes huge beyond reason? I could marvel at them all day long. It is a good moment that we move to Gdańsk to continue the story: one of the biggest Polish cities, it was not excluded from the overall misery. 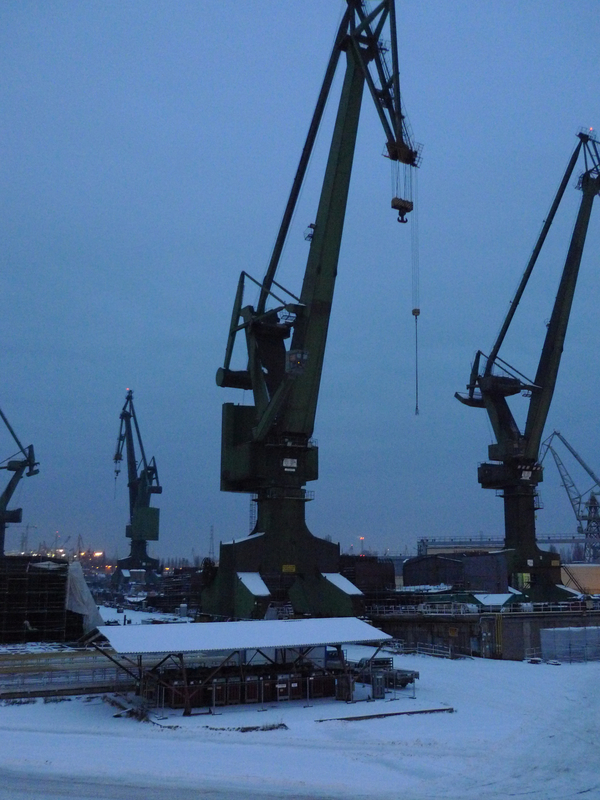 Interestingly enough, the Gdańsk Shipyard seemed to be doing exceedingly well – as time passed, there were more and more orders, and the product was well received within the country as well as abroad. And yet, in 1958 the workers of the K-3 section of the shipyard went on strike, mainly due to horrible working conditions and low wages. The workers demanded an improvement in these two areas, as well as wanted some labor rights to be established (of which there were none at the time). The strike did not last long – the leader of the strike was fired, the other participants of the strike were interrogated for long hours at the Public Security Bureau, and those who continued to work in the shipyard afterwards were penalized with yet lower wages, withdrawal of any bonuses and disciplinary notes in their acts. One must understand what such interrogation or a disciplinary note meant. In communist Poland one line in somebody’s file could open or close all doors – including those granting a new apartment, a car, a stay at the hospital. You would never again as much as dream of obtaining a promotion after refusing to blindly follow the Communist rule. A bad opinion at the local Public Security Bureau could mean your children would not go to college or get a good job, no matter how smart and qualified they were. Of course, for any action there would always be some cover-up reason. In essence, though, to go against the grain was to turn on yourself and your loved ones. Life went on. Some years later, in December 1970, the government of Poland – which regulated all things related to the market, especially the prices and the supply – proclaimed a (yet another) raise of on average 23% in the prices of meat and other food articles. 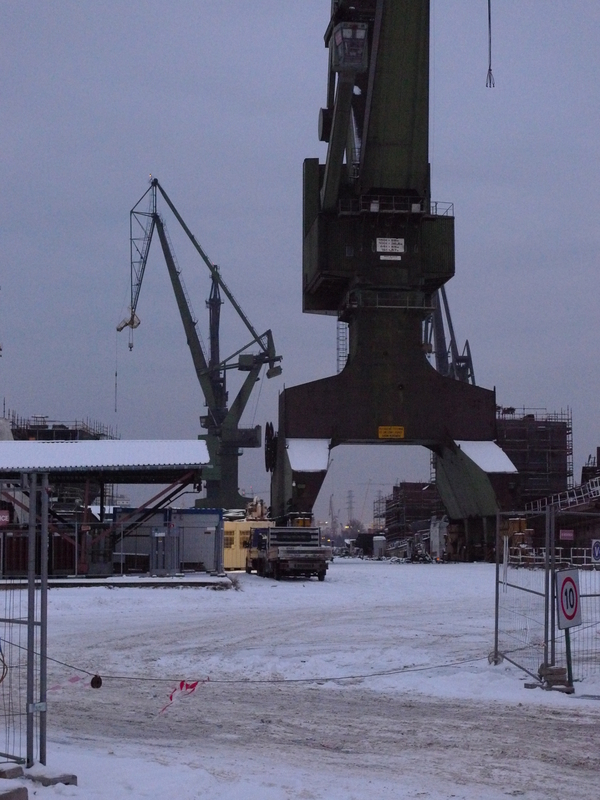 This caused a strike in the Gdańsk Shipyard again, and subsequently in other production plants in northern Poland. This time as well the strike did not last long. On the 16th and 17th of December armed forces were used against the strikers; a few tens of people died. By the time the summer of 1980 came, the economical problems of communist Poland were huge. The state had trouble providing even the most basic groceries, and yet the export of food products to USSR did not cease. At the same time, the democratic opposition – demanding free elections, free speech and the release of political prisoners – was thriving despite the efforts of the Communist regime. On the 14th of August a yet another strike took over the Gdańsk Shipyard along with its 17,000 employees, lead by an electrician and opposition activist Lech Wałęsa, and then it took over the whole country. Shortly, it became clear that the scale of the strikes was of the utmost importance. One cannot shoot the whole country. In result, the so called Gdańsk Agreement was made between the Inter-Enterprise Strike Committee and the government, which, among others, allowed for the creation of an independent workers’ union, the so-called “Solidarność” (Solidarity), and dismissed the top figures in the government, among them the First Secretary Edward Gierek. “Solidarity” did not stop there. 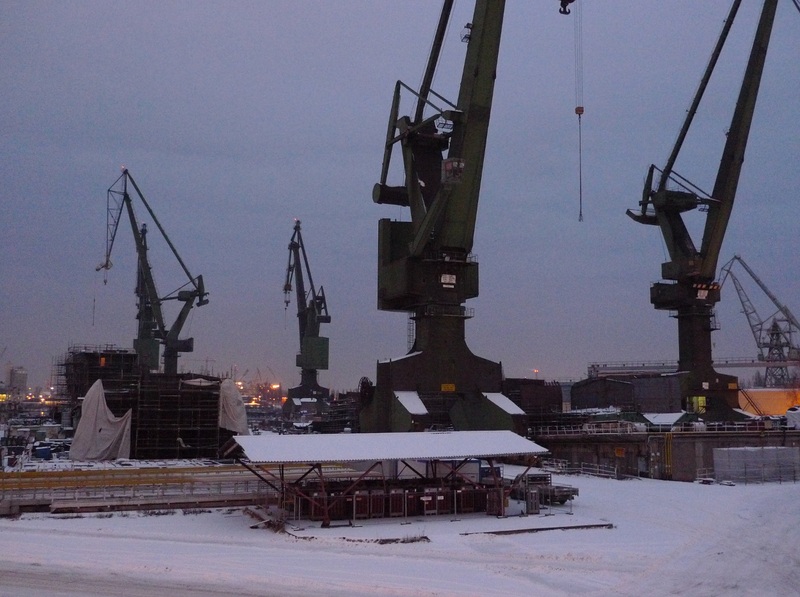 Throughout the whole year of 1981 meetings were held in the conference hall of the Gdańsk Shipyard, during which the members of the union discussed how the state – and thus the political system – should change in order to provide better life for the people. Millions of citizens became involved. At the same time, the government was still struggling with the falling economy and a monstrous debt. Any threats to the existing political system had to be considered lethal. This was an especially dire situation as Red Army forces were still within and around Poland. Some feared that if the opposition movement prevailed, the Soviets would intervene. Initially, the government tried to act against the opposition in various ways, but to no avail. Finally, on the 13th of December 1981 martial law was imposed in Poland. “Solidarity” was outlawed and its leaders – Lech Wałęsa among them – were imprisoned along with the activists (in fact, at least a few of my professors in Poland were interned at the time). The media were censored more than ever. A curfew was imposed and there were armed forces on the streets. This in no way helped the state. While the martial law lasted and after it had been abolished in 1983 – when it seemed the political situation had become stable again – the government frantically tried to rescue the economy within the existing political system. Minor and inconsequential changes were introduced. Communism began to fall either way. In 1988 a wave of strikes hit Poland again. Finally, with no other options at hand, in 1989 the government held talks with the opposition at the so-called Polish Round Table, and in result the first semi-free election since 1947 was held, where the opposition could obtain up to 35% of seats in the Parliament and there was no restriction on the 100 seats in the Senate. In the election, the opposition – with “Solidarity” at its center – got 35% and 99 seats, respectively. The 100th seat in the Senate was taken by an independent candidate. It was a crushing victory. Soon it turned out that the remaining Communist political forces could not form an operating government. The last Communist Prime Minister of Poland, Czesław Kiszczak, resigned on the 15th of August the same year to allow the formation of an administration by the non-Communist members of the new Parliament. On the 24th of August the first non-Communist Prime Minister since the early postwar war years, Tadeusz Mazowiecki, was sworn into his office. On the 13th of September a new non-Communist government was approved by the Parliament. The whole Communist system collapsed; it was over. It is possible that Communism would have fallen regardless of all the social and democratic movements, just as it had fallen in the USSR in 1991. And yet, in Poland the change was backed by the will of the people, and that made the most amazing difference. Try to look up other former Eastern Block countries and check which became independent on the flow of social movements, and which because it just so happened. Then look closely at how these countries prosper today. There is a pattern. I believe there is an universal truth in this story. What I personally find the most humbling about it is that it were ordinary people that became the force behind a political change, with an electrician as their leader. Who then also became a Peace Nobel Laureate and a President, while we’re at it. If you are interested, here is a great 15-minute short piece about Lech Wałęsa and the Gdańsk Shipyard, filmed by Errol Morris. 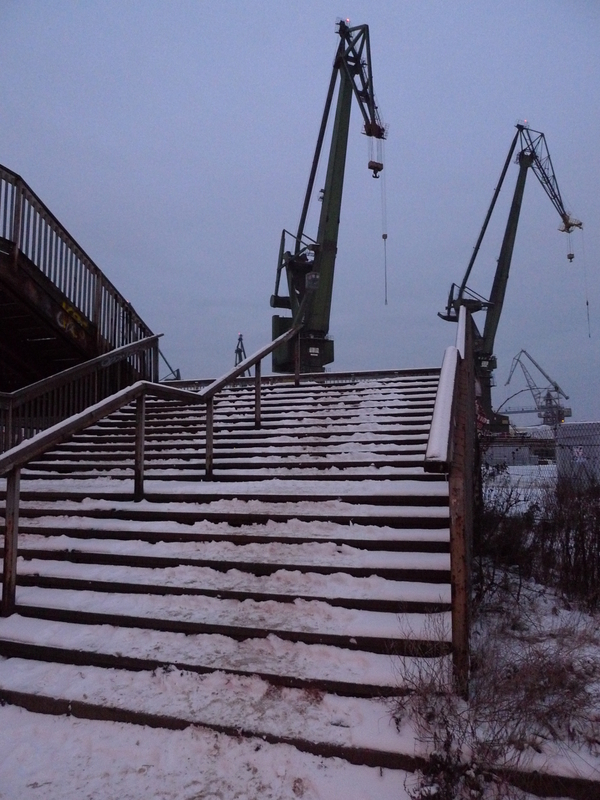 It was strangely heartwarming to think of all that while looking at the majestic cranes of the Gdańsk Shipyard looming darkly in the dusk. 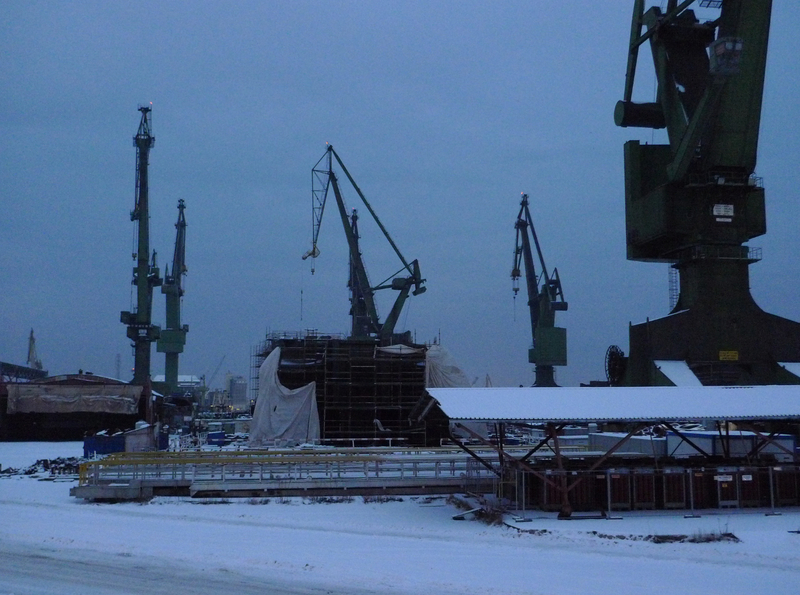 What is left of the Gdańsk Shipyard today? Following the late 1980’s the circumstances have not been favorable for the plant. First, on November 1st 1988 the Gdańsk Shipyard was pronounced to undergo liquidation despite it being the most prosperous of all Polish shipyards – which might give you a rough idea just how desperate the Communist government was to destroy the place that had by then become a symbol of the united opposition. The one of a kind cruise ship “Gwarek”, under construction at the time, has in effect never been finished due to the lack of funding. After a few years of acquiring rust, the trunk of the ship has been sold abroad, where it has become a luxury, five-masted cruiser, known as the Royal Clipper. After the fall of Communism it was not easy, either. The political change together with the rapid transition from a planned economy into a market-based one placed the shipyard in a very tough financial situation. Moreover, the main consumers interested – USSR, East Germany and other countries belonging to the so-called Comecon as well as native shipowners – underwent financial struggles themselves and had a hard time financing even the projects that had already started, which resulted in an overpowering stagnation. The situation of the shipyard was mirrored by the situation of its suppliers and contractors, many of whom had to declare bankruptcy. While the political system had changed, it did not mean that the economical situation of the whole country improved. The reforms took time to formulate, and then took yet more time to bring effects. Taking the ideas of the free market a little bit too far, the government merely observed as the Gdańsk Shipyard fell into a downward spiral of debts, while it should have helped in a quick and effective restructuring, establishing new contracts and markets, and overall improvement of the efficacy of the plant. Because of the soaring debt the Shipyard was declared bankrupt in 1996. Afterwards, the plant changed its private and semi-private owners many times. It continues to employ around 2,200 workers. This entry was posted in Baltic Sea, Communism, Gdańsk, Harbor, History, Industrial, Lech Wałęsa, Poland, PRL, Sea, Ships, Solidarność, Soviet Union, Travel, Winter and tagged Baltic Sea, Communism, Gdańsk, Harbor, History, Industrial, Lech Wałęsa, Poland, PRL, Sea, Ships, Solidaność, Soviet Union, Travel, Winter. Bookmark the permalink. You can enlarge any photo on this site to at least screen size by clicking on it. Enter your email address to follow The Lousy Traveler and receive notifications of new posts by email.